Berlin – city of almost boundless possibilities. In Berlin, you can visit concerts and other kinds of music events the whole year round. A lot of bands, some of them famous, others unknown, big shows and small gigs too, take place in Berlin every day. This city never sleeps – and the music scene does not either! We compiled three of Berlins various concert locations, which are not only very popular but also close to our hostels and therefore easily to reach. Only 700m from our hostel in Berlin Kreuzberg you find the famous Tempodrom. Even its outer appearance shows – this is a very special location: The form of the Tempodrom reminds of a huge festival tent. The perfect symmetric shape of the roof is spectacular – especially when it gets illuminated with miscellaneous lights and designs. The Tempodrom Berlin is subdivided in four different areas: The Big Arena, the Small Arena, the foyer and the outdoor area. 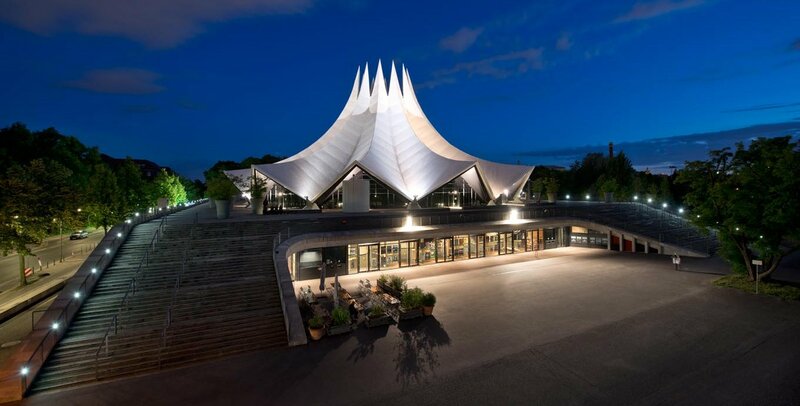 With its capacity of 4.000 guests the Tempodrom is the perfect place to party on a grand scale. The Columbiahalle Berlin is located at Tempelhofer Feld. This club is historic: Built in the post war period the hall was used as a leisure time area for the US Air Force. It contained a large gymnasium and the Columbia theatre. 2014 the hall was completely restored. The Columbiahalle is not only suited for concerts, but also to produce music video clips and festival events. This hall is only 13 minutes (by tram) away from our hostel in Berlin Kreuzberg. The „Heimathafen Neukölln“ (“home port Neukölln”) stands since 2009 for the Neue Volkstheater Berlin. In this location concerts, readings, shootings, plays and theatre take place. Moreover, the Heimathafen can be rented for all kinds of own festivities. The impressive hall for example, is well suited for wedding receptions. The theatre is subdivided into the hall, the studio, the upper foyer and the lower foyer. The hall accommodates up to 800 people. The Heimathafen Neukölln is well worth a visit – not only because of its impressive architecture and the many different styles of music. In this club you experience the colourful, motley, “real” Berlin – only about 20 minutes away (by tram) from our hostel. In Germanys capital city, you find many different concert locations – from small clubs to huge party arenas. Those who spent some time in Berlin, should not miss out on a concert!